her Male opponent Demetrius DeAbreu in the most entertaining battle. With a fair size gathering which included national Cricketer Robin Bacchus, West Indies female fast bowler Subrina Munroe and Digicel’s CEO Gregory Dean watching, the bigger Gomes was on the attack from the start of the first match but DeAbreu was not going to be bullied and fought tooth and nail before Gomes won 11-9. De Abreu, wearing a Florissant Green T-Shirt with the Words Can’t be beaten, matched Gomes shot for shot and in a match highlighted by long rallies for their age and skilful Squash, De Abreu took the second 11-8 to level the scores. However, a determined Gomes, playing several well executed drop shots, won another keenly contested match 11-9 before destroying De Abreu, taking the fourth match11-5 to win 3-1 in the category ‘B’ encounter. The girl power continued when Abosaide Cadogan defeated Ethan Jonas in another category ‘B’ battle. Despite a spirited fight Cadogan lost the first match 12-10 before easily winning the next three; 11-4, 11-6, 11-5. 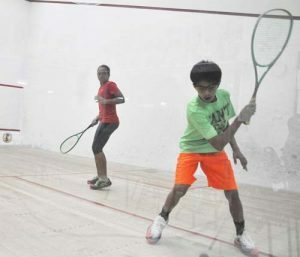 The tournament was without its best junior player, Caribbean U-15 Champion 14-year-old Shomari Wilshire due to International Squash commitments. Although Taylor Fernandes is no longer a junior, but told Kaieteur Sport that she will be playing in Category A to help the junior players and increase the number of the smallest group in the tournament. The four contenders were scheduled to begin their matches last evening. GSA member Lorraine Ince-Carvalhal, standing in for Garfield Wilshire, who is with his son Shomari, said that new talent shone through in the lower categories as some of the young players displayed skilful serves and treated spectators to unexpected rallies. “No doubt these categories will develop as the tournament progresses,” Ince-Carvalhal opined. Matches continue each evening from 18:00hrs with a morning and afternoon sessions set for Saturday. The finals are fixed for Sunday.